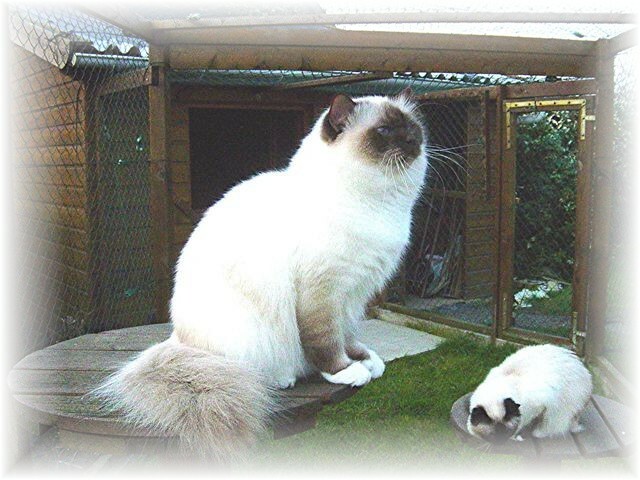 The Sacred Birman is a very affectionate cat; he is only happy when part of a family, he adores the company of children with who he is often gentle and patient, it is a playful cat and close to its masters. A little exclusive with human beings, he doesn’t like living in large numbers, particularly in the breedings. It is a good idea to guide children from the beginning in the relationship that they form with their cat so that they learn to let the cat come to them and not to annoy it. Once the notion of respect is in stalled, you will see that a very close cat-child relationship, based on mutual trust, will become evident over the months. This is obviously a very enriching experience for the children. 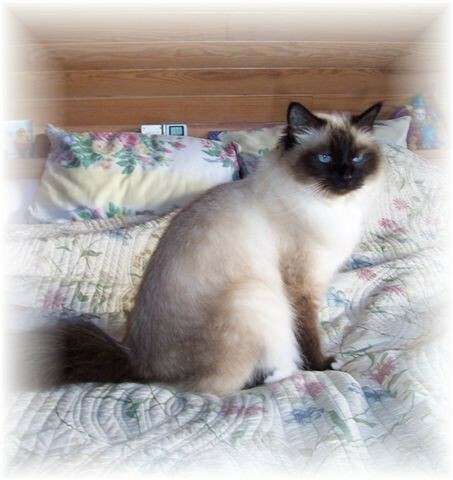 In indoor cat, above all, in the same way as a Persian, he can prove to be incapable of defending himself and protecting himself from the dangers of outdoor life. It is not advised to let him walk alone in the garden. 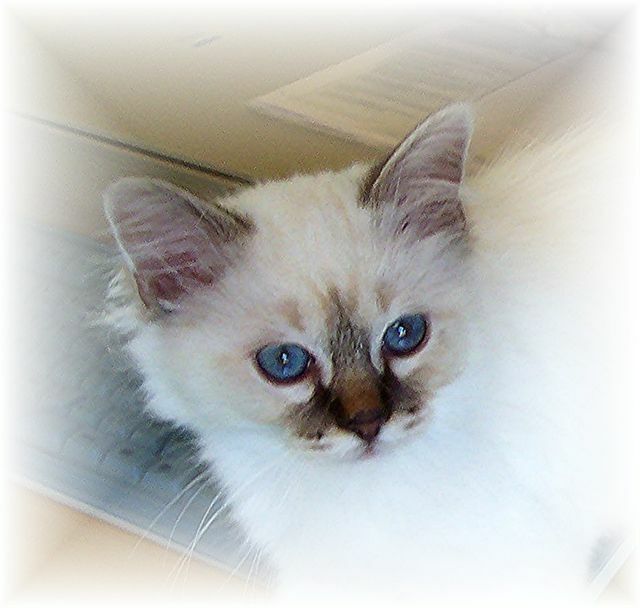 In addition vaccinations do not protect it against three deadly and incurable viruses, the Fip ( feline infectious peritonitis, it is a mutation of coronavirus, the FCoV*, and there is no possible vaccine), the fiv (virus of an immunodeficiency in found in cats, no possible vaccine ) and felv (leucosis, the vaccine being effective in only 80% of cases). 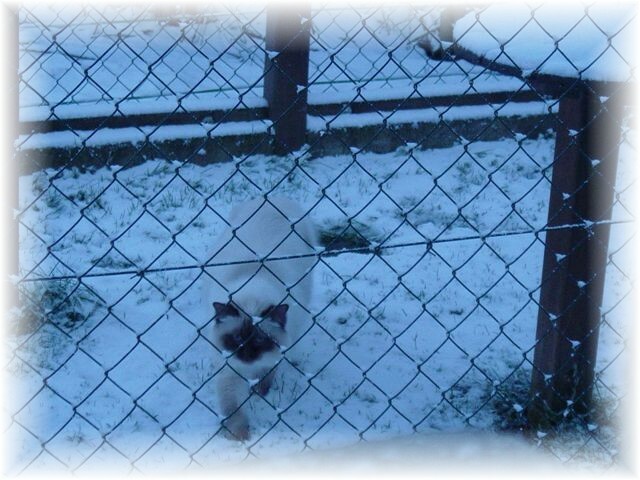 Fip can be caught be indirect contact, on a lawn (if a contaminated cat has gone into your garden over night and left contaminated excrements in your garden), this illness is caught by others through nasal contact. Our Kitten follow a homeopathic protocol of nosodes until we leave the house, we no longer make allopathic vaccine on kittens for 4 months in order to ensure better immunization under the best conditions because kittens still have too many maternal antibodies until that age. It is a good idea to check the teeth and do a scaling every three to four years. Its mid length fur allows for easy upkeep and it gets very few knots. In winter one weekly brushing is sufficient, while the moulting period, one should brush them daily to prevent the formation of hair balls in the intestine _ this moulting period can draw on for several months. A dry vet food ( True Instinct High Meat, Amikinos, Farmina Grain Free, Wildcat Etosha ), and every day at their disposal some white meat or some cooked fish, will allow it stay in great shape for a very long time. It drinks water that does not have a heavy mineral concentration, especially if it is fed with dry food in order to protect its kidneys. A vitamin supplement can be given from time to time, but only under a vets supervision. When should Sterilisation be done? Females can be sterilised young. In the United States, early sterilisation is practised for a long time, done from the age of two months at the same time as the vaccinations. It is worth noting that this does not alter in any way the growth of the kitten – the growth’s cartilages close up naturally during the hormonal growth in puberty. 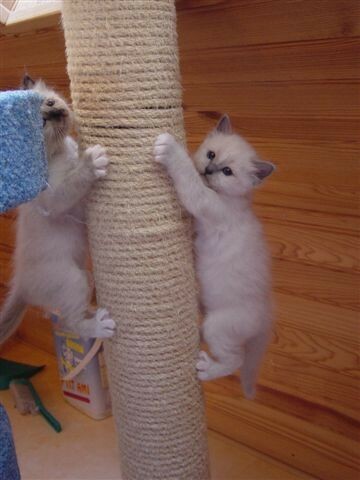 Sterilised cats have, on the contrary, the tendancy to be of a slightly larger size than the others. The only inconvenience of such an early sterilisation aussi lies in the fact that an anaesthetic is required and so this should only be done by experienced practitioners. The ideal age is between 6 and 9 months for a female, before it goes on heat if possible (this normally begins after the age of 6 months and rarely earlier than that. For the male, the intervention is done at practically the same age, between 6 and 9 months, which avoids the markings, a habit that it could keep in certain cases if he is sterilised at a later date. Sterilisation before the age of 2 is a good way of protect the cat against the risk of teat’s tumours, extremely serious in the majority of cases. Giving the cat oral contraceptives also increases the risk of teat’s tumours, these risks are not to be taken lightly because they can considerably reduce the life span of your cat. As well as repetitive heats even uninterrupted can create the formation of ovarian cystes, which can be very serious for the health of a female. 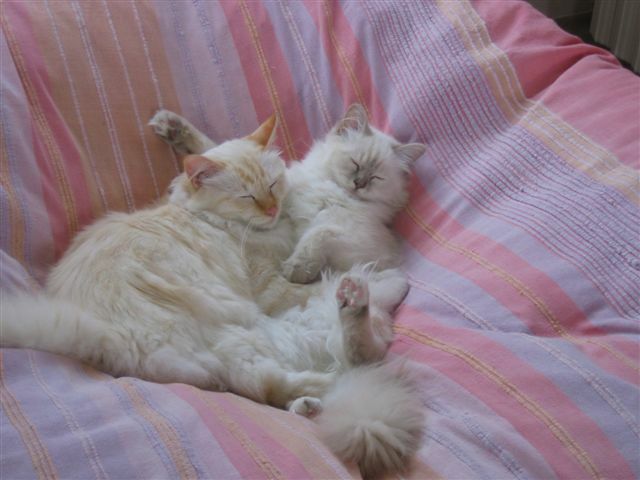 The fur of sterilised cats is often thicker and the sterilised cat is often calm and serene, the males become again big babies, which is not always the case for no sterilized cats. 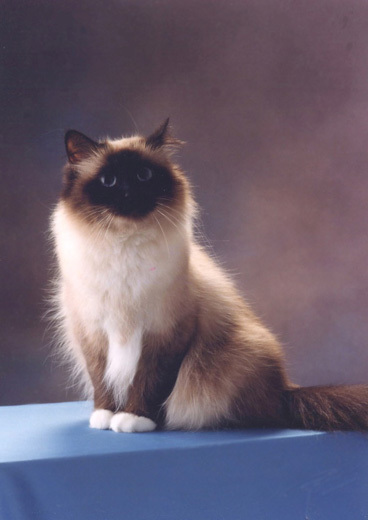 To conclude, the Birman is a cat with a moderate appetite and obesity does not exist in the race, whether it is sterilised or not. If one feeds it food of a good quality there are no particular problems. What is more there exists in several brands low fat foods which allow your little cat to keep its figure whilst keeping its plate full! Your vet can advise you on a suitable choice.